Finally a new leader, as resident celebrity columnist Terry McBride rides 2/3 of the Dutch connection to first place with 31 points. For the moment. “Yank”, which becomes less ironic when you learn that he’s actually American, has moved up into third despite being too afraid to actually pick the USA or Dempsey. Of course, he is actually in Brazil right now following the American team around so he probably hasn’t been sober enough to care since their big win on Monday. Meanwhile, Ang is still holding steady at 8 points. As for Spain – the end of an era, a changing of the guard, blah blah blah, about 17 other gag-worthy cliches according to the unbelievably pompous British announcer. Still, Spain has been eliminated, and who doesn’t love that? I mean, besides 50 million Spaniards and Jesse Wlock. Not a great day all around for Jess, considering how uninspiring Costa (Chelsea’s latest big waste of money) looked running in circles up front. Regardless of your thoughts on the matter, however, they simply deserved their fate. They just gave up against the Dutch after that disallowed Silva goal, and today Chile outworked them at every turn. Not sure if Chile has the playmakers to keep scoring against the big boys but I like their chances of taking the play to Netherlands next game, as well as in the next round against possibly Brazil. Incidentally, the Netherlands barely escaped a hard-working Australian team this morning and probably wouldn’t have if it wasn’t for Mathew Leckie inexplicably passing up an open shot from 2 yards then having Holland storm back the other way and slide an easy 30-yarder past the sleeping keeper. From a possible 3-2 Australia lead to 3-2 Netherlands in a 20 second swing. Then Leckie tried to atone by out-Robbening Robben with a couple completely awful dives. You know you’re milking it when even the Dutch get mad at your theatrics. 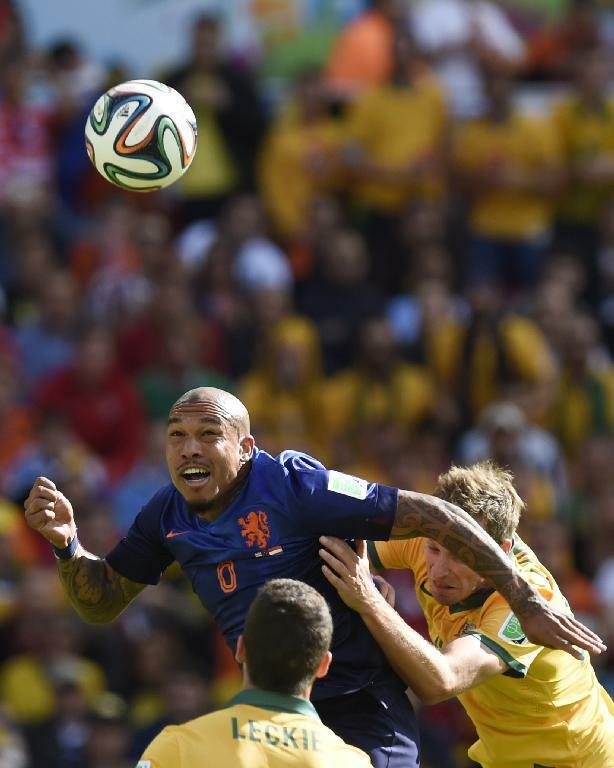 But Nigel de Jong was a beast, I’ll give them that. And Croatia beat Cameroon. Handily. And if anybody can shed some light on what the hell Song was thinking with that flying elbow, well, you’ve got me beat. Previous Previous post: If Russia Makes a Comeback, Does Anybody Care? Next Next post: “We Learn Man-Marking Next Week”, argues England.